The city of Athens is one of the few places in the world that can boast a history of over 5000 years. No other place contributed so much to Western Civilization as did Athens, when it was the spiritual center of the world back in its heyday in the 5th century BC. Many of the principles of modern day society can be traced back to Ancient Athens, the birthplace of Democracy. Athens was the place where some of the world's greatest philosophers and thinkers, such as Socrates, Plato, and Aristotle changed the way we think and perceive the world even today. Science and the arts reached an unparalleled peak during that time and a new art form, theater, was born in ancient Athens. A symbol of that era of Athens is the Acropolis, towering high above the city. Following the decline of the ancient empires, Athens power and influence had dwindled during this time, however its heritage passed on to become the foundation of today's modern society. 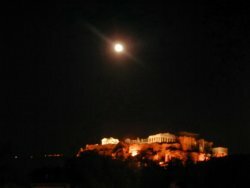 Athens itself turned into a small town during the Middle Ages, a time that was followed by centuries of foreign rule. It was just over 170 years ago that Athens became the capital of the young Greek state, after a fierce war of independence. The 20th century brought an explosive growth to Athens, transforming it into a vibrant metropolis of over 4 Million of population, and one of the world's most fascinating places. Visitors to Athens will experience a city combining modern and ancient buildings. Athens visitors can see the the Dionysos Theater the world's oldest theater where the great theatrical plays of Aeschilus, Evripides and Sophocles were first performed, or walk around the Pnyx where the Athenian citizens assembled and voted on major political issues. Visitors can also stroll around the Agora, the ancient marketplace, can climb onto Arios Pagos, the seat of the court of parliament, where the Apostle Paul preached to the Athenians. The most memorable part of any visit to Athens, would be the ascent to the Acropolis. The magnificent Parthenon, build on top of the hill in the 5th century BC, is one of the greatest architectural monuments of all times. 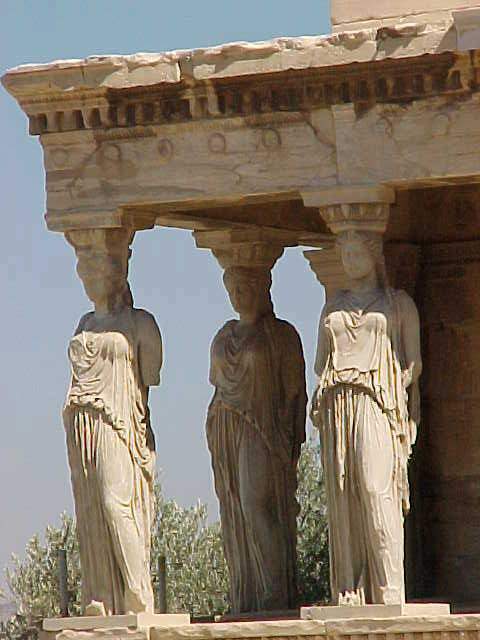 The temple is dedicated to Goddess Athena, the Goddess that gave its name to the city of Athens. A unique archaeological park featuring temples, theaters, cemeteries and marketplaces surrounds the Acropolis. Athens visitors can see famed monuments such as the Olympian Zeus Temple, the Keramikos ancient cemetery, the Ancient Agora, the Hephaistos Temple, the Attalos Arcade, the Tower of Winds and much more. Splendid works of art can been seen at the National Archaeological museum. Athens is also the home of many other museums such as the Benakis Museum, the Byzantine Museum, the Museum of Cycladic Art. Athens also features several more sights to visit. The stately 19th century buildings such as the Panathenaikon Stadium, the University of Athens, the Zappion, the Iliou Melathron. The Greek parliament on Syntagma Square, with its frequent change of the guards in front of the parliament by soldiers dressed in colorful traditional costumes. The hills around Athens serve as excellent vantage points offering panoramic views over Athens city, the most spectacular of which is from the top of Lycavitos Hill in central Athens. The hilltop with its picturesque Saint George Church can be reached on foot, by car or cable car. Highly popular with the Athens visitor is Plaka, the old town of Athens, with its narrow streets, picturesque churches and old mansions. These quarters which have been continually inhabited for over 5,000 years, have retained the charm of a bygone era and are a reminder of the way Athens used to be a few decades ago. Few other places are so filled with historic sites as Plaka; ancient monuments, Byzantine churches, mosques and stately homes stand side by side. Scattered through the Plaka quarters are cafes, tavernas and numerous shops. This inviting neighborhood is a pleasure to stroll day or night. Next to Plaka is Monastiraki with its small shops. Around Avyssinias Square you will find lots of bargains and a huge variety of new and antique items. Nearby is also the historical central market of Athens, on Athinas Street with a great variety of food, as well as the fashionable and lively district of Psiri with Art Galleries, trendy bars and restaurants. Most restaurants offer live Greek music with your meal. Greeks are well known for their zest for life, so it comes as no surprise that Athens has a hedonistic nightlife, with late suppers being typically taken around 10.00 PM onwards and nightclubs filling up after midnight. Athens will prove to be a challenge for the most avid shopper. The most exclusive area for fashion is Kolonaki, with its many boutiques featuring designer labels. Elegant shops can also be found in Ermou Street, Ermou runs from Syntagma Square passed Monastiraki and on to the most popular cafe and nightlife area of Thission. Many boutiques for both men and women can be found around Omonia Square and on Patission Street, as well as in the southern seaside suburb of Glyfada and in the northern suburb of Kifissia. Athens is one of the few great cities of the world that is also a beach resort and it takes only minutes to reach several excellent beaches from central Athens. The southern suburbs such as Glyfada and Vouliagmeni, have become fashionable cosmopolitan destinations in themselves, combining the pleasures of a seaside resort with the trappings of a city. The beaches nearest to the city center are situated in the suburbs of Paleo Faliro, Alimos, Elliniko, Glyfada and Voula. Further away are the beaches of Kavouri, Vouliagmeni and Varkiza which call be easily accessed by inexpensive Athens taxis or by public transport.